Netrunner is back. 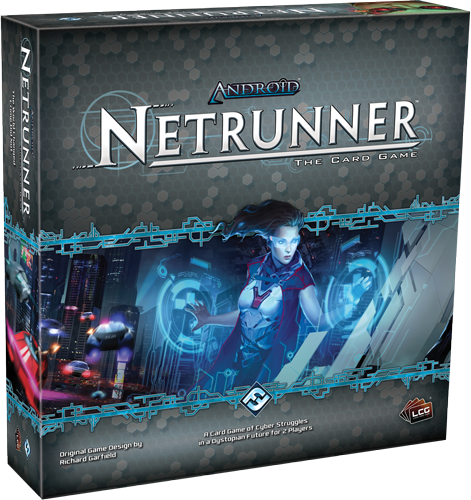 It seems Fantasy Flight games is releasing a revamp of Netrunner as part of their Android line. The original CCG had a huge following, not quite as big as Magic, but I think at the time it ran a pretty healthy second place, or not... I gotta admit I was never into the CCG scene... but I do remember it being hugely popular with extremely loyal fans, and remember Pyramid praising it to the rafters. If the art we have seen so far is any indication, the game is georgeous. I am not familiar with Android, other than the premise, it being a cyberpunk boardgame borrowing heavily from Bladerunner, but the whole line seems to be incredibly polished with fantastic art and layout. It appears that when licensing the game from Wizards Of The Coast, they neglected or didn't bother to license the setting from R. Talsorian, which is disappointing. The game instead drops the Cyberpunk 2020 universe for the Android universe. Honestly, I am not sure how they managed to keep the name Netrunner, since that was a core Role name of Cyberpunk 2020, and I am pretty sure R. Tal still owns it, but maybe R.Tal never got around to trademarking it, or maybe they sold the trademark to WOTC. I really don't know. What I do know is that the beauty of the original Netrunner is that with the release of the Cyberpunk 2020 supplement Rache Bartmos's Brainware Blowout, you could use the orginal netrunner CCG as netrunning rules for you Cyberpunk 2020 game. It was a brilliant move, and an incredibly fun replacement for the actual games horrific netrunning rules. I don't know if the new game is going to retain any semblance of compatibility, but perhaps someone out there can find a way to make it work. Honestly, from the looks of it, the new game won;t even be compatible with the old one, and I know that under the new setting many cards will have been dropped or renamed. I will definitely be keeping my eyes out for this. It's on my list to watch for also. I want to see some reviews on any changes to the mechanics and hear from people playing the game before I drop my money on it. The original Netrunner was pretty popular but it seemed to be popular in pockets and never really got a good broad footing. Back when it was new I went to one convention on one side of the state and there was a lot of people playing it. Two months later at a con on the other side of the state nobody played it and dealers where trying to blow it out at reduced prices. Feeling Lucky... You damn well should!